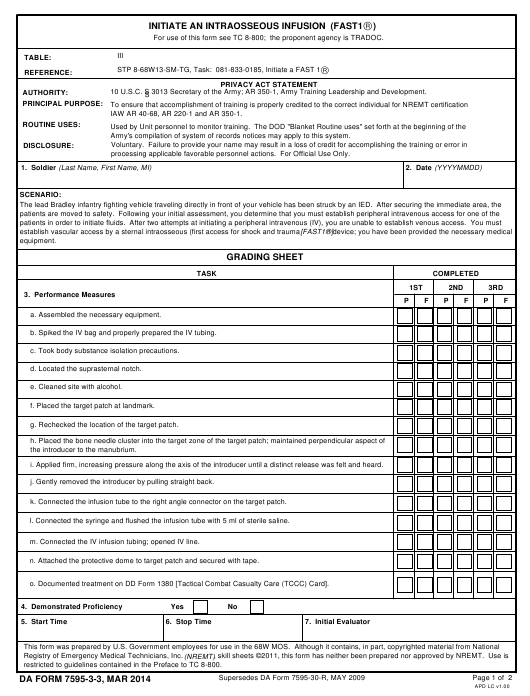 DA Form 7595-3-3 - also known as the "Initiate An Intraosseous Infusion (fast 1)" - is a United States Military form issued by the Department of the Army. The form - often mistakenly referred to as the DD form 7595-3-3 - was last revised on March 1, 2014. Download an up-to-date fillable PDF version of the DA 7595-3-3 down below or look it up on the Army Publishing Directorate website. 10 U.S.C. S 3013 Secretary of the Army; AR 350-1, Army Training Leadership and Development. IAW AR 40-68, AR 220-1 and AR 350-1. Army's compilation of system of records notices may apply to this system. processing applicable favorable personnel actions. For Official Use Only. a. Assembled the necessary equipment. b. Spiked the IV bag and properly prepared the IV tubing. c. Took body substance isolation precautions. d. Located the suprasternal notch. e. Cleaned site with alcohol. f. Placed the target patch at landmark. g. Rechecked the location of the target patch. the introducer to the manubrium. i. Applied firm, increasing pressure along the axis of the introducer until a distinct release was felt and heard. j. Gently removed the introducer by pulling straight back. k. Connected the infusion tube to the right angle connector on the target patch. l. Connected the syringe and flushed the infusion tube with 5 ml of sterile saline. m. Connected the IV infusion tubing; opened IV line. n. Attached the protective dome to target patch and secured with tape. o. Documented treatment on DD Form 1380 [Tactical Combat Casualty Care (TCCC) Card]. Registry of Emergency Medical Technicians, Inc.